Large metal prints - XXL Sizes with 100 % FREE delivery! Large metal prints are particularly impressive due to their colour intensity, level of detail and contrast is especially in XXL formats. Large metal prints printed as an eye-catcher for your own home will bring a touch of sophistication to your decor. Loved by galleries and professional photographers, large format metal prints have an elegance that no other medium can match. The Alu-Dibond is still easy to work with, even in larger formats. In contrast to metal sheeting, the Alu-Dibond weighs much less but is still sturdy. Because large metal prints look so impressive, they are often used for decoration in the gastronomy business. 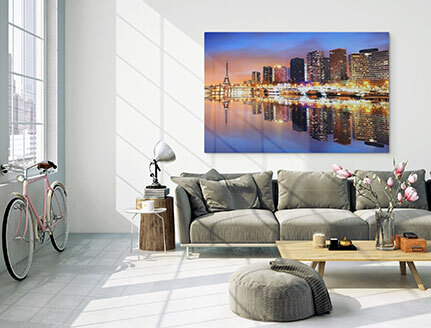 Expansive wall areas can be decorated very attractively using large or custom size metal prints. Tip: The JPEG photo format is ideal for large metal prints. 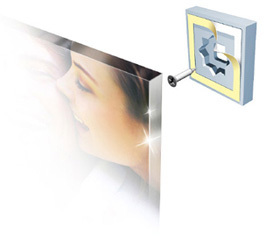 Tip: The “Couple” hanging system allows your metal print to “float” on the wall. 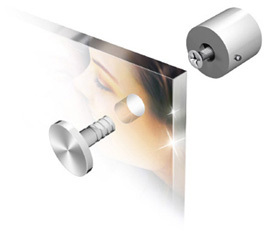 We offer XXL metal photos in two variants. There are no limits as to size – we can manufacture any size on request, even custom formats! Individual size requirements are manufactured down to the centimetre according to your specifications. Fromb a size of 140 x 105 cm or 150 x 100 cm, the pictures in production are considered large-format. We can also offer you large collage metal prints. Even in this range of sizes, the large metal prints are resilient and easy to hang. Just remember that custom formats may take longer to produce. Our express delivery service is available if you need your large metal prints in a hurry. 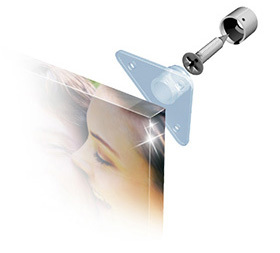 For large format metal prints, you need an image file with the appropriate resolution. We accept files in JPEG and PNG formats. If you want to use a colour profile, we recommend SRGB or AdobeRGB. Since resolution requirements for metal printing are already quite high, very large files are required for XXL prints. This can easily mean a file size of over 50 MB for large metal prints. However, we cannot accept files of this size via our upload function. You can send files like these via DropBox or We-Transfer to our contact address. 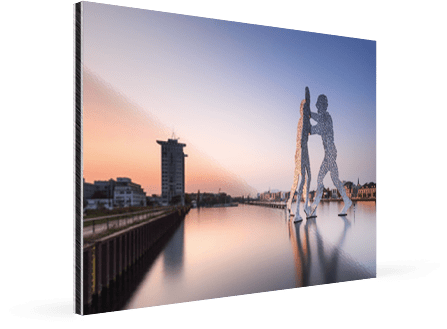 It couldn’t be easier to order your large metal prints in our online shop. First you need to upload a photo file. This should have a resolution of at least three megapixels or more. This can take a few seconds depending on your internet connection. Once your photo is uploaded, you can choose the size and format for your large metal prints in the next step. 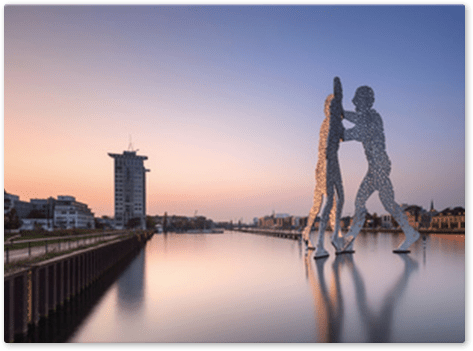 We also offer metal prints in square formats and panoramic metal prints. Custom metal prints are also available on request. Then you can select the variant for your large metal prints. The standard variant in white semi-matte is perfect for photos with high quality requirements. The butler-finish metallic variant is particularly suitable for large metal prints in black & white and for photographers who are looking for something just a little bit different.